10) Christian Eriksen: He almost single-handedly qualified Denmark for the World Cup and has also contributed to Tottenhams good (albeit unsteady) season. For Danish fans it is great to have a world class player again. 9) Harry Kane: Has stepped up to become one of the most dangerous strikers in the Premier League and perhaps in Europe, where he is sought by some of the bigger clubs. 8) Pierre Emerick Aubemegyang: In my view Africa's best players, although at national team level Gabon are not in the World Cup and had a disappointing Africa Cup of Nations at home. But in the Bundesliga for Borussia Dortmund he has been their star player, and is being sought by big clubs as the Germans are struggling. 7) Luis Suarez: Not the main scoring role any more, but participates in Barcelona's awesome attacking force. Although overshadowed by Cavani, he was part of the Uruguay National team that qualified for the World Cup, where he will be one of the stars to watch, as always! 6) Lionel Messi: Absolutely out-of-this world player, who has taken on the responsibility at Barcelona, where they totally depend on him, and for Argentina, whom he almost single-handedly qualified for the World Cup. But titles have not been forthcoming this year, and the dependence on him is a risk both for Barcelona and for Argentina. 5) Kylian Mbappe: He was the find of the season in 2016-17 for AS Monaco, being absolutely splendid in their making the semifinals. He then went on to Paris Saint Germain in August, where he has been one of the stars alongside Neymar in what is one of the most exciting teams in the world at the moment. He also got his debut on the French national team and scored his first goal in a World Cup qualifier against Netherlands. Expect to see him at the World Cup! 4) Kevin de Bruyne: Much of Manchester City's success in this season is because Kevin de Bruyne has stepped up in his role as playmaker, where he is showing his world class. Also on the Belgian national team he is a core player, and is one of the superstars to watch out for in the World Cup. 3) Cristiano Ronaldo: The Portuguese has had a wonderful season winning everything with Real Madrid and also qualifying for the World Cup with Portugal. He is another out-of-this world player. 2) Lieke Martens: When the Netherlands won the European Championship this year it was in particular thanks to this splendid playmaker, who also changed to FC Barcelona, immediately becoming a core player in their current narrow lead in the league. 1) Neymar: Perhaps he was the most spoken about player ever when he changed from Barcelona to Paris St. Germain this year, becoming the most expensive transfer ever. But his qualities are unquestionable: there was a hole in Barcelona's offense initially when he left, while he in France he has been the super star of a team that is aiming for the highest. For the resurrected Brazil side that qualified in awesome style for the World Cup, he is also a superstar, and there is no doubt that Neymar is looking to take all titles in 2018! 10) Gremio: Winners of the South American Copa Libertadores they became the third Brazilian club to take a third title. They represented South America in the Club World Cup. 9) Panama: Panama qualified for the World Cup for the first time ever in a dramatic final round of CONCACAF qualification which left the giant favourites of the USA out, and a small and underestimated Central American country with a huge and well-deserved party! 8) Manchester City: After a 2016/17 season without titles Manchester City is now a well-oiled machine under Pep Guardiola, leading the Premier League in style, and so far cruising through the Champions League. Although they went out of the 2016/17 Champions League in the last-16 against Monaco, that was plausibly the most incredible match of a year with many incredible matches. 7) Manchester United: Jose Mourinho is the easiest man to dislike in modern football, but one cannot deny his amazing skills as a manager; after some initial difficulties he is taking Manchester United back to the top. They won the Europa League, have cruised during their return to the CL (and must be considered favourites against Seville in the last-16) and are the greatest threat against Manchester City's dominance in the Premier League. 6) Chelsea: Winners of the Premier League (and FA Cup finalists only to lose to their rivals of Arsenal), they have nevertheless had more difficulty in the PL this season, as other teams have made things more difficult. In any case they are through in the CL, where they will face mighty Barcelona. 5) Wydad Casablanca: a fantastic football year for Morocco (who also qualified for their first World Cup since 1986) is best represented by the success of Wydad Casablanca, who won their second CAF Champions League title ever in a memorable two-legged final against Al-Ahly. 4) Paris St. Germain: After winning the league for 4 seasons in a row the French title in the 2016/17 season went to Monaco, which was a disappointment for the ambitious French side, who also were eliminated from the CL in a memorable but disappointing two-legged clash against Barcelona. But with the arrival of Neymar Paris St. Germain are one of the most exciting teams to watch in Europe, and are first in the league as well as have been playing outstandingly in the CL, where they will face Real Madrid in what promises to be one of the most exciting matches in 2018. 3) Juventus: Juventus won the Italian league in 2017 for the sixth season in a row, and made it to their second CL final in three years, disappointingly losing to Real Madrid. They have struggled more in the new season, as they trail Napoli in Serie A. In the CL they trailed Barcelona in the group stage, but will face up and coming Tottenham in a very interesting last-16 encounter. 2) Real Madrid: Had it not been for their last few months, where they trail Barcelona, Atletico Madrid and Valencia in the Spanish league, they may have made first spot. However, nobody can deny that they had a great year, taking the Spanish title, the Champions League title, the Spanish Super Cup, and the Club World Cup. Undoubtedly a great side is in a low form currently. 1) Netherlands Women: During a year when Dutch men's football had a horrible year, and national team football was generally boring, the women gave us a fantastic European Championship (far better than the men's in 2016), won in a memorable final by the Dutch hosts against a great Danish side. The Netherlands are my team of the year! For Real Madrid it has been a good year: winners of the Spanish League, the Champions League, the Spanish Super Cup (when they trounced Barcelona) and lately the World Club Cup against Gremio. Zinedine Zidane has been a genius managing the Spanish side, so it must be strange for him to end the year in such a bad way by losing 0-3 at home to their arch-rivals from Barcelona, and almost surely disqualifying themselves from the title race, being 14 points behind Barça. Will this mean the end of Zinedine Zidane as manager? In my view that would be cruel to the best manager that Real Madrid has had for a long time, and I think he could bring them back (all eyes will be on the Champions League), but Real Madrid does not work like that. Liverpool and Arsenal tied 3-3 in a very entertaining but poorly played match. "Entertaining for the neutral but not for the knowledgeable" as I saw on a tweet that was later deleted. Liverpool are currently on a roll; they play intense and high pressure, and with a Mohamed Salah who is at the top of his career (I have never been a big fan, and I am still of the opinion that he misuses too many chances) they are a scoring machine. But football is also about defending, and here Liverpool can in no way be hoping to win the title! 0-2 ahead, in full control, and it only took them 3 minutes they fall apart! While defending is absolutely dreadful, you also have to question why they were not 4-0 ahead against a dreadful Arsenal. On top of that you have a goalkeeper in Mignolet who costs goals: I still wonder where his hands were on Xhaka's equalizer. Jurgen Klopp is a great manager because of his approach to football, confidence in his young players and passion for the match. But if he does not also focus on defending, he will remain a great manager without titles. Arsene Wenger has given Arsenal more titles than such a club could ever hope for. That said, one has to wonder whether he is over the top, or whether it is even his responsibility that his players seem unmotivated for such a match. Arsenal's first half was a disgrace in attitude and fight in front of their fans. There were some improvements in the second half, where Alexis Sanchez 1-2 goal seemed to give them some faith. But in the end one came away with a bad impression of players like Alexis and Ozil, who really only show glimpses of their quality. Maybe Arsenal needs an overhaul, and maybe, just maybe, it will have to start with the man who they owe everything to, Arsene Wenger. In any case, a great match, but I will come with a daring prediction (because all prediction about the PL are notoriously hard): none of these teams will be Premier League champions! Tottenham-Juventus: The English were the surprise by winning their group ahead of Real Madrid, but have at the same time not been too steady in their league. They are now facing another of the great teams of Europe, and will have to play their best. Juventus has not looked as impressive as in the previous season, but will surely not forgive any mistakes by Tottenham. Basel-Manchester City: Basel finished second in their group by defeating the other Manchester team, United, in Switzerland. But over two matches they are surely the underdogs against a Manchester City side that remains among the favourites for the title. Porto-Liverpool: The undefeated English side will be favourites against a Portuguese side that is nevertheless no pushover. That said, Porto was not as impressive in the group stages, only passing by hapless Monaco and an inexperienced Leipzig. Liverpool must be happy and expecting a quarterfinal, which may prove their weakness. Sevilla-Manchester United: Sevilla could not get past Liverpool in the group stages, and the Spanish side are a shadow of their past years’ Europa League side. In the meantime Mourinho is creating a powerful Manchester United side that is likely to move past Sevilla. Paris St. Germain-Real Madrid: Surely the most awaited match of the last-16 as the defending champions are facing one of the new top contenders for the title. While Real Madrid has been looking in a slight crisis in both la liga and in the CL, PSG has been cruising through both the French league and the CL (most scoring team, and only once to Bayern Munich). This clash will nevertheless be a big test for the French side: can they defeat the champions? Can Neymar outshine Ronaldo...? Shakhtar Donetsk-Roma: The Ukranians made it after a last match victory against Manchester City, ahead of the Italian favourites from Napoli, who probably underestimated Shakhtar throughout. Roma should not underestimate them, but will probably also be considered favourites to make it to the quarterfinals. Chelsea-Barcelona: This encounter is a neo-classic clash of the Champions League, as these sides have faced one another in some memorable encounters, and this promises to be another. Barcelona have been awesome, while Chelsea can mostly blame themselves for not having won the group, and now faci g the toughest rival of them all. Bayern Munich-Besiktas: Bayern Munich did not win their group but ended behind PSG which is always a disappointment for the Germans. That said, they will be happy for the draw, as Besiktas are probably the most underrated side left in the competition, despite them winning their group undefeated (but what many consider a weak group), and with experienced players. That said, Bayern Munich must surely be considered favourites. Cannot wait for the knock-outs to begin! Since I arrived in El Salvador I have been watching a lot the Mexican league, and I have really enjoyed a great league, with excellent teams, players and fantastic atmosphere. The second leg of the Apertura final was played tonight. It was a historic final as it was the first time the two arch rivals from Nuevo Leon, Rayados de Monterrey and Tigres UANL, faced one another for the title. The first match, at UANL had ended 1-1, and since Rayados had been strong all season, they were probably favourites as they were to play the second leg at home in a fantastic stadium with an incredible atmosphere. And it all seemed to go the way of the home team as they went ahead 1-0 after two minutes on a goal by the Colombian Dorlan Pabón. Nobody had scored more than one goal in Monterrey during this clausura tournament, so things seemed to be going the right way for Rayados. But Tigres were well organised and in particular Enner Valencia was causing a lot of trouble for Rayados left back. It was Eduardo Vargas who equalised, and shortly after Another Colombian, Francisco Meza scored a second for the away team. Francisco Meza, central defender, played a fantastic match in defense, and crowned it with the goal that would eventually be the winner. In the second half Rayados attacked well, but Tigres defended better. Towards the end Rayados got a penalty, but Aviles Hurtado (yet another Colombia) was shooting for the moon when he kicked the ball high above the goal. Could not help but feel sorry for Rayados, who were the best team throughout this tournament and their great home fans, who must be heartbroken. As to myself, I am thrilled by having discovered the excitement of the Mexican league, and I now hope to be able to visit Mexico to watch some football, and maybe find myself a Mexican club to support! Living in El Salvador time difference has made it challenging for me to follow the Champions League live. But I have watched matches after the fact, trying not to hear results beforehand (which is why I have been off Twitter during matches). Today I saw Liverpool’s trashing of Spartak Moscow, to give them a slightly surprising first place in the group. All in all, English teams have been doing better in previous years, even leading to some slight surprises. Group A: Manchester United under Mourinho has been excellent albeit in a relatively easy group, where Swiss Basel took second place (and were the only team that managed to defeat United). CSKA Moscow took third place, while the Portuguese giants of Benfica were a huge disappointment with 0 points. Group B: The least surprising group with Paris St. Germain and Bayern Munich cruising through, only taking points from one another, but PSG winning the group on goal difference. Everything the minnows of Celtic and Anderlecht did will quickly be forgotten. Group C: Roma were slightly surprising as they won a group for the first time since 2008. Back then, it was also ahead of Chelsea. Both teams were better than the disappointment of Atletico Madrid, who were basically eliminated by the Azerbaijani debutantes from Qarabag, who got their only two points by two draws with the Spanish giants! Group D: Another group without surprises with Barcelona cruising to first place and Juventus taking the second spot. Sporting took third place, completely unthreatened by a disappointing Olympiakos. Group E: One of the four undefeated teams in the CL is Liverpool. With their trashing today, they are the second most scoring team after PSG (who is nevertheless not undefeated). They won the group in style ahead of a Sevilla side who in the 2016 Europa League final had been one level above Liverpool. All credit to Klopp, who has a long term plan for Liverpool. Spartak Moscow still took third place, while Maribor managed to finish with a draw against Sevilla. Group F: Manchester City only lost the last match, when they were already group winners, and should be a team to look out for this season. In the meantime Shakhtar Donetsk were a slightly surprising runner up, ahead of Napoli, who had probably expected to make it. Feyenoord took all hopes from the Italians by winning their last match with nothing to play for. Group G: The big surprise was in this group by Besiktas, winning as one of the four undefeated sides. Many will not expect much from them, but one must watch out for a team with such experienced players as Pepe, Gary Medel, Ricardo Quaresma or Alvaro Negredo. This may not be the last surprise they make. FC Porto took second place just ahead of German Leipzig. In the meantime last years’ semifinalists from Monaco were a shadow of themselves having lost so many of last season’s stars. Group H: The other big surprise winners were Tottenham. Not because they are bad, but more because everyone was expecting Real Madrid to win the group. Instead Tottenham took first place undefeated, including a memorable win against the Spaniards. Tottenham are unstable though, and cannot be considered favourites. But Real Madrid of course still are. In the meantime Borussia Dortmund are in the Europa League where they will be considered favourites. Apoel trailed them all. The BBCs World Football Phone In just celebrated its 20 year anniversary, and as always I greatly enjoyed the show. I have been listening to the show on podcast since 2006, when I was in Ghana. During my time in Mozambique it became a staple on my rather dull life, and I think I have barely missed a show since then, as I have been in Venezuela, Liberia, and now in El Salvador. In all these places the show has been a fantastic companion. I am rather more dark and pessimistic than the show is, but the positive spirit of the show has always put me in a good mood, and made me feel I am part of this family of worldwide football fans, who love the game, and can have a pint and laugh at our silly discussions about the beautiful game. This is more rare than common, which makes the show so much more special! The hosts are opening against Saudi Arabia, the first time an Asian side will be playing the opening match. But the favourites of the group are likely Uruguay, who should be happy about the draw. Portugal versus Spain is already one of the most highly expected matches of the tournament, and these sides are surely the favourites to win the group, although Morocco and Iran will have everything to play for and low expectations. Surprises could happen in this group. The French are surely huge favourites in this group where the other three teams (who all qualified through play-offs) are to play for the scraps. Don’t expect much from Australia, but likely Peru and Denmark will play for second spot. One of the most interesting groups: Argentina’s eternal non-performing favourites again drew the African giants of Nigeria (Argentina-Nigeria is now a modern mini classic), Croatia’s incredible midfield, and the highly expected debutants from Iceland. This is one of the groups to watch. Brazil’s favourites for the title got a good draw, where the Serbians are a team to watch. Expect Costa Rica and Switzerland to fight for the scraps, although both teams are capable of surprising (something the Ticos surely showed in 2014). There is always a group of death, and this is it with the defending champions of Germany against three strong sides from Europe, Asia and North America. While Germany are favourites all of them could take points from Germany, and one another. Another group where the two European sides are huge favourites and will likely fight between them for first and second spot. The debutants from Panama will be an interesting addition, while Tunisia could make some upset. Expect ugly things from Polish fans in a group where Poland (who were the weakest side in pot 1) are only weak favourites. Colombia and Japan have solid sides, while Senegal is highly capable of surprising. Living abroad for many years I have had difficulty following Denmark’s greatest Club, Brøndby. Interestingly a Salvadorean colleague told me she had been in Denmark and said she had enjoyed going to football matches. I was too afraid to ask if it was FC Copenhagen or some other second rate Danish side, but she said: “Brøndby were so great”! This made me happy, and how it seems to be going is making me even happier. Last time Brøndby won the league was in 2005, with Michael Laudrup as manager. Since then, things have been difficult, also as the club was close to bankruptcy and flirted with relegation. Only in the last couple of years things have begun looking up, and this season seems to have fully grown: they are top of the league, having both defeated the defending champions and runners-up. There is still a long way to go, but this is the best things have gone for years. I have been happy to see Valencia back where they belong, namely among the top of the Spanish league. After some hapless years with a stream of managers and players who did not perform, things seem to have stabilized under manager Marcelino, and three of the new players are surely becoming the revelation signings of the season: Goncalo Guedes is on loan from PSG, where he has no chance of replacing Neymar. But he is a talented youngster who has flowered in Valencia, and is now surely eyed by the biggest clubs in Europe. Geoffrey Kondogbia was considered a huge talent when he started, but he faded a bit during his time at Inter, and was surely hoping to get attention again. And he certainly has: he fit perfectly into the Valencia midfield, where he has turned into a dynamo of energy, with running and tackes, as well as a fantastic overview of the field. Also on loan from Inter, they may look to get him back next season. The Italian striker Simone Zaza was on loan from West Ham last season, and although he did not overly impress Valencia used the buy-out clause. This has proven to be very wise: with nine goals he is currently second, only to Lionel Messi, on the Spanish top scoring list, and looks highly motivated to give many more goals. While these three players have stood out as new players, others, such as Jose Gaya, Rodrigo and Dani Parejo are also flourishing, and I just hope Valencia is able to keep onto all these players for the next few seasons at least. Today Valencia, second in the league, played the league leaders FC Barcelona in what was a true test on whether Valencia are in the right direction. After a difficult first half (where Messi had a correct goal annulled, strengthening the call for video referees, something I have always thought was necessary) they put better pressure on the Catalonians in the second half, and even went ahead 1-0 on a goal by Rodrigo, following good combinations of the left side, where Guedes was giving Umtiti problems throughout the second half. I am going to repeat what I said a couple of days ago: Africa deserves more places in the World Cup.and is plausibly the only continent that deserves more places than their current 5, mostly to the detriment of Europe (please give the four play-off places in Europe to Africa!!!!!! ), but I even think that Africa could deserve a play-off with South America´s fifth (Africa´s 6th against South American 5th), against Asia´s 5th, and against Oceania´s 1st (Africa´s 7th would knock out New Zealand). An African side is not going to be World Champion in my lifetime. But there is no continent where the excitement and passion for football is as alive as in Africa, and the talent is raw and plentiful. Africa should have more places because Africa deserves them. Now why does Africa not get more places in a 32 team World Cup? Money, yes, African fans and teams are not as profitable as from other continents (specially fast-growing poor-at-football Asia), and do not attract as many sponsors. Racism, absolutely: in 1966 the rest of the world did not see Africa (or Asia) worth a single spot, and the same tendencies are alive today, where the crumbs of World Cup qualification are thrown at Africa sides. But as an extension of this, there is also the problem of African federations themselves, who band together for the crumbs, instead of insisting more strongly for more African influence in FIFA and in the World Cup. For Qatar 2022 Africa will go from 5 to 9 teams (17% of their members in the finals) with Europe going from 13 to 16 (29% of their members in the finals. And note that with 6 for South America, it will be more likely to qualify randomly from that federation than not playing at all). This is an example of more crumbs being given to Africa (and the rest of the World for that sake). This post will not make me popular, so let me say it from the start: it is about football teams and not countries. The best thing for these teams qualifying is that people can raise their flag and sing their anthem, because in terms of football quality, none will add anything to the tournament. I have been watching many of these last play-off matches with disappointment, not just at the lack of quality, but also of the fact that in a 32-team World Cup this is a confirmation that there are really too many mediocre sides. Honduras-Australia: yes the pitch was bad, but frankly that is just a useful excuse for a disciplined match from the Australians and a poor performance by the Hondurans. Will any of these sides contend for the World Cup title? Unlikely. Will they raise any eyebrows in the tournament? Even more unlikely. Peru is likely to qualify, and being fifth in such a contested qualification as the South American one is always an achievement. That said, I am sure Peru will not raise any eyebrows either. They are from the hard and defensive side of South America, and is unlikely to win many friends, or add anything to the beautiful game. In Europe we have three of four qualified teams: Switzerland, Croatia and Sweden. Of these, only Croatia, with its talented midfield and young players is one that we will want to see in the World Cup. Granted, the Swiss are a quality but too defensive side, while Sweden has to be credited for eliminating Italy from the World Cup, but little else. Of course they do not deserve to be there if they don´t qualify, but one has to wonder if the distribution of the groups is good enough: Poland won one group, Iceland another, and with all due respect for them, Italy is better than either of these sides, or Denmark and Ireland for that sake. A World Cup without Italy will simply not be the same. That brings me to Denmark and Ireland: of course as a Dane I support Denmark, but as a fan I have to face the truth that Denmark will add anything to the tournament, except, as with the Irish, to the beer sales in Russia. Africa only has 5 spots in the World Cup, and is plausibly the only continent that deserves more, preferably instead of Europe (give the four play-off places in Europe to Africa!!!!!! ): Morocco, Tunisia, Egypt, Nigeria and Senegal will all be exciting to watch in Russia, but countries like Ghana, Cote d'Ivoire, Zambia, Burkina Faso, Algeria.... Will all be sorely missed, and would have made the World Cup much more exciting than the four European teams that have qualified. The World Cup in Qatar will have 48 teams. More for Africa, yes, but also more pretty mediocre sides, all to the excitement of mass nationalism (the football World Cup and the Olympics are the only good reason for countries to exist at all). Expect a World Cup in Qatar with a lot of 0-0´s and second-rate matches. In San Salvador I went to watch the qualifiers in Sports bar called Strikers. A nice place that was full of Colombians and a few Peruvians to what promised to be a clash as we were also watching the scores of the other matches in South America. Argentina needed a victory in Quito, and it looked bleak as they went down 1-0 after one minute. But none other than Lionel Messi scored three goals to give them a victory and a spot in Russia. The World Cup would not be the same without Argentina and Messi, so we should all celebrate. In the meantime Uruguay got their expected qualification with a 4-2 victory over Bolivia, while Paraguay destroyed their own hopes by losing 0-1 at home to Venezuela (and watch out for the young Venezuelan side in the future!). As all this was happening Peru and Colombia were playing a nervous match until Strikers exploded with two goals: James scored for Colombia as Brazil went ahead against Chile. This meant Colombia were qualified. Paolo Guerrero equalized for Peru, who needed a win, and Colombia seemed nervous, but it didn't matter: Brazil ended up trouncing the defending South American champions 3-0, meaning that all of a sudden Chile were out. Colombia are in Russia while Peru are in the playoffs against New Zealand. It was all too much in one of the most excitng qualification nights ever, but it did not stop there as we swithched over to the CONCACAF qualifiers, where nothing was going as expected: USA was losing 2-1 to Trinidad & Tobago, Honduras was winning 3-2 against Mexico, and just as we started watching Gabriel Torres gave Panama a 2-1 lead against Costa Rica. It ended like this, and that means Panama are in Russia, Honduras are in a playoff against Australia and the USA can go home. Granted, Panama qualified with a non-goal, but that doesn't take away that USA lost it themselves. The team has lost five matches, and they were outright arrogant in many of their matches. They have to face it: despite the advances, and MLS and all that, USA is still only a mid-ranking CONCACAF nation. The World Cup is much better without the USA! A great evening in San Salvador as we look forward to a final round of playoffs to find out about the last teams in Russia. Today Iceland made history: with a 2-0 victory over Kosovo they won their World Cup qualification group and will be going to their first World Cup ever. And with this, Iceland is the smallest nation (in terms of inhabitants) ever to have qualified for a World Cup. There are only 11 men on the pitch, but surely bigger nations will feel sad they didn't make it. In Africa this has not been the case, as the two most populous nations, Egypt and Nigeria have both qualified with a match to go. Senegal and Tunisia are also on the verge of qualifying, while Cote d'Ivoire and Morocco will play a real final for the final spot. In CONCACAF Mexico and Costa Rica have qualified while USA, who seemed in trouble, are now close to qualifying after trouncing Panama 4-0. While Japan, Corea, Saudi Arabia and Iran are qualified, while Australia and Syria are set for a clash for the last Asian spot. The South American World Cup qualifiers are always the most difficult and most dramatic. None of the teams are bad, and as we head into the final round of matches six out of ten teams have options to join the already qualified Brazil. Uruguay will almost surely join them, as they only need one point against Bolivia to qualify. The South American champions of Chile took an important step with a victory against Ecuador, but will probably still need a result in their last match against Brazil to be certain of qualifying. Not impossible, so Chile is likely to qualify. Colombia could have made it with a home victory against Paraguay. And they were up 1-0 until the end of the match when the Arsenal goalkeeper made two huge blunders in added time, giving Paraguay two goals and the victory. Ospina may have cost Colombia a World Cup, but they have another shot against Peru at home. The problem is that Peru will also be fighting for a World Cup spot: after 0-0 against Argentina they have fifth place, and with a win will surely be in Russia, and could make it with a tie, depending on Argentina. Argentina! Oh dear Argentina! After home ties to Venezuela and Peru they seems the least likely team to qualify: they need an away victory against home-hardened Ecuador. All credit to Peru, but their style will not win them friends in Russia, so Argentina will be doubly missed. Come on! No matter what you think of Argentina, a World Cup without the Albiceleste will not feel real! (Besides the fact that for me it will be hardly worth watching). Paraguay, who for a long time was deemed out, has better chances of qualifying than Argentina. With their victory against Colombia they just need a victory against Venezuela at home, which would likely give them at least a play-off. Next week everything will be decided, and I pray that Argentina will make it. Please pray with me. Bayern Munich is one of those clubs where only victories count. Carlo Ancelotti, one of the world's greatest managers (three Champions League titles) knew this, having managed other big clubs such as AC Milan, Paris St. Germain and Real Madrid. So it cannot have been a surprise for him when he was fired, following the Bavarian 0-3 defeat against Paris St. Germain. It is harsh indeed, but Bayern Munich have ambitions to win every year. Bayern Munich is to be temporarily managed by Willy Sagnol. The question is who, after Jupp Heynckes, Pep Guardiola and Carlo Ancelotti (seven Champions League titles between the three), is experienced enough to take on one of the most difficult manager jobs in the world. My month of September has been busy because I have moved from the country of the great George Weah (who incidentally happened to be running for president of the country) to a small central American country that is most known internationally for the legendary Magico Gonzalez and infamously for the biggest defeat in a world cup match (10-1 to Hungary in 1982), El Salvador. El Salvador loves its football and I look forward to getting to know it. In the meantime, it has been difficult to follow the Champions League because of time difference, although I have followed enough to be impressed of Paris St. Germain (Neymar and Paris may bring greatness to one another), Chelsea and Manchester United. With the rebirth of some of these sides, alongside the "usual suspects" it does seem to be heading into a great season of CL. With time difference and everything! Group A: Manchester United is back and probably favourites ahead of Benfica, with two difficult outsiders with Basel and CSKA. Group B: Everyone will be watching Paris St. Germain with Neymar, and their ambitions to make it all the way. In particular against Bayern Munich, who as always are favourites for the title. Celtic and Anderlecht are there to fight for the Europa League. Group C: Chelsea is back as champions of the PL, and with ambitions to get far, alongside with Atletico Madrid. Roma could threaten either side, while the debutantes of Qarabag will be happy for any points they can get, and the experience of playing Champions League. Group D: Juventus and FC Barcelona have had some amazing clashed in the last seasons of the CL, and will likely fight for the top-2 of this group. Olympiacos continues to be a great home team that can take points from everyone, while Sporting also could take some points. Group E: Last seasons' Europa League finalists are in the same group, and again Sevilla should be considered favourites, despite Liverpool always having more confidence than quality, but under Kopp may achieve something. Spartak Mrioscow could fight for one of the spots, while nobody expects much from Maribor. Group F: Manchester City are favourites in this group, but it is not an easy one! Napoli surely has the quality to take on the English, while Shakhtar and Feyenoord are solid and experienced sides that should never be underestimated. This could be one of the closest fought groups. Group G: Big expectations to the Monaco side, that has nevertheless lost some its key players. RB Leipzig are debutantes that will be interesting to see, and could cause upsets. Of course, FC Porto is a side that can beat anyone, while Besiktas is always difficult with their strong home fans. Group H: Defending champions of Real Madrid are surely favourites, with Dortmund and Tottenham fighting for second place. Whoever of them takes points from the Spanish may have a good shot. In the meantime the Cyprus champions of Apoel may be there to annoy some of these big teams. I am going to be unashamedly subjective in expressing my delight at FC Qarabag being the first team from Azerbaijan ever to make it into the Champions League. The champions of Azerbaijan defeated the Danish champions of FC Copenhagen 1-0 at home, and an away goal in the 2-1 loss in Copenhagen was enough to put them in the Champions League. Granted, FC Qarabag may have made it to the tournament by a qualification where they the champions they defeated were not from the strongest leagues (Georgia, Moldova and Denmark) but they deserve to have made it after defeating some Danish champions that appear to believe that being champions of Denmark is enough to defeat other teams! I am delighted Copenhagen is out! The Bundesliga opens today with defending champions Bayern Munich facing Bayer Leverkusen. Despite the dominance of Bayern Munich, the German league always has surprises, amazing young talent, plenty goals and some of the best atmosphere in Europe (Borussia Dortmund fans are perhaps the best I have ever seen). And the Bundesliga leads the way also in terms of equality, with the first female referee, Ms. Bibiana Steinhaus, who will be making her debut in the Bundesliga! I hope that we will soon see her in the Champions League! I am not a Barcelona or Real Madrid fan. In fact in terms of fandom I pretty much dislike both teams, although in terms of football quality I am full of respect and admiration for what they have achieved. Therefore, pretty much the only thing I look forward to in the Spanish league is to see these teams play against each other, so watching the first leg of the Supercopa final tonight was obligatory. The quality of both sides is unquestionable, which Ronaldo and Asensio's amazing goals for Real Madrid are witness to. And Real Madrid are truly amazing at the moment, picking up where they left last season: Zidane has created a team that combines experience with immensely talented youth (and he shows he believes in them), freedom of action with tactical discipline, and with a strength in depth that Barcelona cannot match. But both teams lower their own quality by not letting the ball alone talk, but constant acting, diving and bitching. It is at times painful to watch. The vulnerability of Barcelona became so obvious today against a top Real Madrid side, that only favourable refereeing gave them a chance in the match: an incorrectly cancelled goal for Real Madrid, a non-existent penalty and a questionable red card for Ronaldo (despite the fact that one cannot help but be smugly happy for Ronaldo's off-the-shirt yellow card that he seems to get on purpose) just helped Barcelona not become totally humiliated. Two of the best teams in the world, and refereeing is totally amateurish... This happens more in the Spanish league than in any other league (both Real Madrid and Barcelona have favourable referees in any match against other sides), and there is no question that a league with such low quality of refereeing (where players again and again take advantage of them) can in no way be called among the best in the world. And finally, about Neymar: I understand why left Barcelona. It was not the money: as an ambitious young man he went to a side that is looking forward and investing, while he left a Catalonian side that before was relying on Messi-Suarez-Neymar, now seems to rely solely on Messi and Suarez, with quality in some positions, but barely any in others. Look to PSG for the coming season, not to Barcelona! This evening I was speaking with a Chelsea fan who said that Conte should be fired because of their PL opening 2-3 defeat to Burnley. That is in my view a bit early: of course the manager is responsible, but Chelsea are still defending champions. They did look as if they were still on vacation though, against a Burnley team that of course was top motivated to play the champions. There have been some great matches already: Arsenal and Leicester had a fireworks of goals when Arsenal won 4-3, and perhaps it is a prelude to the season for Liverpool in that defensive errors and a late goal only gave them 3-3 against Watford. The favourites for the title are in my view Manchester City; they have invested heavily, and I expect that Guardiola now understands how to pace his side in the most difficult league in the world. City opened with a 0-2 victory over Brighton. Finally, one thing that made me particularly happy was to see good ole' Wayne Rooney score the winning goal for Everton in his debut against Stoke. And who is on top after one match? Newcomers Huddersfield opened with a solid 0-3 victory against Crystal Palace. I do not expect Huddersfield to remain on top though. I watched the Euro 2017 final in my place in Monrovia. A Dutch friend came by to barbecue and beer, and amid friends it was a great afternoon of great football. The Danes were better in the first half, even taking the lead, and equalizing after going behind 2-1. But the orange home fans carried the Dutch through in the second half, when they were the best team, and won 4-2. The Netherlands is only the fourth country to win the Euro for women, and breaks the German dominance since 1995. But most importantly is that this tournament has been fantastic: far better than last year's Euro 2016 for men. Just compare the two finals: the complete boredom of Portugal's victory, or the excitement of the women's final? So this is hopefully another step towards more attention to the women's game. For Danish fans, such as myself, these Danish ladies have made us dream of national team prowess again, and that I am grateful for. 25 years ago the Danish national team won the Euro 1992, and now, 25 years later, a Danish side is again in the Euro final, namely the Danish women's side, who could repeat history! The Danish ladies defeated Austria in a nerve-wrecking semifinal, where the Austrians managed to defend with passion against a lot of Danish chances, but also proved lousy at penalty kicks, missing one early in the match (that could have given them the victory as the match developed), and then missing three penalties during the penalty kick contest. The Danes held their nerve, and they will be facing the Dutch hosts in what will be a difficult final. The Netherlands defeated Denmark 1-0 in the first round, and will be favourites after defeating England 3-0 n the semifinal. But anything can happen in a final and these Danish girls will fight hard! No matter what it is great to have these ladies that have made Danish football fans dream again! Denmark in the Euro 2017 semifinals! Due to travels and the fact that it is not shown on TV everywhere I have not been able to fully follow the (women's) Euro 2017 in the Netherlands. But today I watched Denmark's huge upset against the defending champions of Germany, when Denmark won 2-1 in the quarterfinals. After being down 0-1 at halftime the Danes came back to upset the favourites in a dramatic and exciting match that has nothing to envy the guys. The Danish goals were scored by Theresa Nielsen and Nadia Nadim, and in particular the latter played such a great match that she should become the idol of a lot of up and coming footballers in Denmark (boy girls and boys). I am a fan and will be cheering for Denmark in the semifinal against Austria (who edged Spain on penalties), and just hope I will be able to watch it in my next destination! I had really wanted Chile to win; I don't think I had been as much against a German victory since 1992. So Germany's victory in the Confederations Cup final hurt. That said, the young German team were clearly the smartest, far outweighing the Chilean experience, who attacked without bite, while the Germans defended patiently and struck when the (awful) Chilean central defense made another mistake. It was not world champion style, but it showed that the current world champions, besides an amazing youth pool, can play on many strings. Their central defense was particularly strong, with an impressive performance of Antonio Rudiger and Matthias Ginter, who showed that the future defense of Germany is in sure hands. But nobody can help but be impressed of the German youths. What I most liked about the Confederations Cup semifinals was to see Portugal's arrogance humiliated. After playing like they had done during the Euro against Chile (pulling a lucky 0-0) they hoped that penalty kicks would carry them to the final, but it was not to be because of a surprising Claudio Bravo (I have never been a fan of him, but thank him for what he did against Portugal. He must have been taking lessons from Willy Caballero) and not least, Portugal's own stupidity. The manager Fernando Santos made three substitutions (Quaresma, Moutinho and Nani) and these three players all missed their penalties to end it all for Portugal. But even stranger was to not have Cristiano Ronaldo take the first penalty: that is often the case, like Messi in the Copa America final against Chile in 2016, as the captain he stepped up, but only to miss. So why did Ronaldo not shoot? No matter what, it seems arrogant, and Portugal lost as much because of themselves as because of Bravo's skills. And that is the best thing about the Confederations Cup. Chile will face Germany, who was nice to Mexico by only defeating them 4-1. At least the Mexicans will avoid Chile, who defeated them 7-0 last time they met in a competitive match! When you can remember something that happened 25 years ago you qualify as an old fart. I am an old fart now, and I will never forget exactly 25 years ago when Denmark won Euro 1992, in the final against the world champions of Germany. Every Dane who live then remembers it in his/her own special way that only someone who lived back then will be able to relate to. I was in between countries, a cocky teenager, and in so many ways I remember this as a special year, and this as a special day. Every player from that day has a special place in my memories, and the entire match is something burned into my memory: who I was with and where I watched it and the entire celebration after. I guess it is a compliment to what football can do; to what football can mean; to what football does; that 25 years after, an old fart like me, having traveled the world, still remember this match as so really special! Portugal-Chile: Portugal seems like a team that really wants to win this tournament, while Chile are certainly also committed, but look shaky. Chile often starts their matches well, but second half often seem tired, and in particular their defense seems vulnerable, led by a Claudio Bravo who does not seem too confident. I think the European champions will make it to the final. Germany-Mexico: Joachim Low is experimenting with this German side, and although they have not looked like the best team in the world, they have made it to the semifinals through victories over Australia and Cameroon, and a tie with Chile. Mexico have been up and down, looked bad against New Zealand, but took points from their European counterparts of Portugal and Russia, and could certainly surprise a German side that is not wholly invulnerable. The Russian hosts have been a disappointment, only managing a meager victory against a mediocre New Zealand, but were not up to the task against qualified opposition. It does not augur well for the World Cup, as Russian fans will not be motivated if their team is eliminated early on. The African champions of Cameroun were also disappointing, despite low expectations, but it shows that a potential African world champion is very far away. In the meantime Australia did well representing Asia, and New Zealand fulfilled all low expectations of the champions of Oceania. This will be a summer without major football tournaments, and so the FIFA Confederations Cup is a poor replacement. Nobody seems to really want to win it, as the modern myth that the winner will not be world champion, has really caught on among superstitious footballers. Rather, the biggest sides mostly want to try out some new players, so matches are bound to be a bit dry. Include to this the absence of some of the legends: nobody is saying it out loud, but the only former world champion present in Russia is Germany. The absence of Brazil, Spain, Argentina or Italy just takes some of the spice away. All this said, I have been watching some matches with interest, only to confirm my cynicism about the tournament: Chile looked good against a dangerous Cameroun, but only seemed to seal victory when Alexis Sanchez finally came on. Portugal looked solid with Cristiano Ronaldo, and are perhaps the team that has most seemed eager to win the tournament. The hosts from Russia have put in decent displays, but are mostly worth seeing because of their fans. Mexico and New Zealand have been poor and Germany won their obligatory victory over Australia 2-3 by experimenting somewhat with some new players. I hope it gets more interesting, or there will not be much consolation in this football-hungry summer. Before today's u-20 World Cup final in South Corea we knew we would have a new World Champion. Neither Venezuela or England had ever been in a final at youth level. Venezuela had never been in a final at all, showing the incredible strides Venezuelan football has made in the last 15 years, while England had not been in any final since their legendary World Cup triumph in 1966. So whoever won it would be special. Both teams had reached the final unbeaten, with Venezuela having a strong scoring and attacking record. The Venezuelan side nevertheless seemed more stricken by the occasion than the English lads, who dominated first half, also taking the lead on a goal by Dominic Calvert-Lewin from Everton. This was in the face of a poor Venezuelan defense, who was saved by goalkeeper Wuilker Farinez. In the second half the Venezuelans put more pressure on an English side that also seemed to grow more nervous, and there were many mistakes as the match progressed. It was more intense than beautiful, and only English goalkeeper Freddie Woodman seemed cool when he saved a penalty kick from Adalberto Penarando (the big Venezuelan star was a frustrating sight today), and became the best goalkeeper of the tournament and a hero for England. England won 1-0 and are World Champions. I was supporting Venezuela, but it was a well-deserved victory for England, who should take advantage of having such a talented pool of players. In the meantime, Venezuela made it to a final, and lost it. They have a base of players to fight for their first World Cup, perhaps in 2022, but I would not count on it. I watched the Champions League final between Real Madrid and Juventus in a bar called Lila Brown in Monrovia. Not many people and a pleasant atmosphere, but as Liberia is entering rainy season the satellite signal was unfortunately quite bad, and it was difficult to enjoy the game in full. After the first half the score was 1-1, and it still looked as the match could go to either side: Juventus had dominated the start of the first half until Ronaldo's excellent counter-attacking goal. Mandzukic made the outstanding equalizer, and with such a goal one could justifiably expect anything to happen. But Real Madrid turned up the volume in the second half, and won 4-1 against a Juventus side that proved broken after only letting three goals in during the entire Champions League season. Cuadrado's unfair red card against Ramos' disgraceful acting did not make any difference, except the feeling of Real Madrid players being allowed to do whatever they want with impunity. Sergio Ramos does not deserve to be called a champion. Despite Ramos, this is Real Madrid's 12th title, and the first time the Champions League is won twice in a row. It seals the club as the best in the universe. They have been very solid during the season, all thanks to the genius of Zinedine Zidane, who must surely enter the annals of one of the greatest managers of all time, alongside that of one of the greatest players of all time. Lately Arsenal fans have been trashing their manager over 20 years, Arsene Wenger. For yet another year Arsenal did not win the Premier League title, and for the first time in 19 years they did not qualify for the Champions League. No matter what, today Arsenal won the FA Cup, 2-1 in the final against the PL champions from Chelsea. This is the 7th FA Cup title under Arsene Wenger, now the most-winning FA Cup manager ever. So is this a team with no titles??? I really do not understand Arsenal fans' criticism of Wenger, as their mediocre club could never have done better. Has Manchester City done better with all their money and fancy managers???? Arsene Wenger is the best manager that Arsenal will ever have, and they should be thankful about this latest title. Because if Wenger leaves, Arsenal will be waiting many many years before they win any other title. Tonight I watched the Europa League Final in a bar in Monrovia, amid massive rain, which made it difficult to listen to the commentary, but at least it was possible to watch the match and drink beer. Manchester United were not likeable as they played on their far superior experience against an Ajax Amsterdam side of charming youngsters who were surely up past their bedtime. Ajax hardly had a shot on goal as their naive attack crashed against Mourinho's defensive wall, in what was a bit of a disappointing final, as it never seemed Manchester United's victory was in any doubt whatsoever. Manchester United are now in the Champions League next season why they, and Mourinho, can add another European title to their stack. And in Monrovia, the rain continued. Seasons are ending all around Europe, and we can already see some of the titles being handed out! With a 0-1 victory over West Bromwich Albions Chelsea mathematically became champions of the Premier League with still three games to go before the end of the season. This cements Chelsea's amazing season, which few saw coming I think: a disastrous last season which led to the hiring of Antonio Conte as manager, and he has stabilized the team, that plays excellent football. One has to wonder whether the absence of European football may as well have been an advantage, as they were able to focus entirely on the Premier League. In Germany Bayern Munich has won the Bundesliga again and as expected by many. That said, it is a disappointing season, as they did not win the DFB Cup and were eliminated in the Champions League. Bayern Munich is set to go through changes next season, so it remains to be seen how they will do. In Italy Juventus is only a victory away from taking the title, while in France Monaco are on the brink of taking a title that seems to have belonged in Paris since 2013, and this also cements their extraordinary season where they won themselves a lot of friends in the CL! Although Atletico Madrid gave Real Madrid a scare (and fans hope for a good game) in the first quarter of last nights' Champions League semifinal second leg, the result was never in doubt: although behind 2-0, when Real Madrid settled into the match they showed their quality and after Isco's goal, their place in the final was never really in doubt. And for any major threats, Keylor Navas was solid in goal. Real Madrid can go all the way, although they will have to play their best against a Juventus side that did not need to make much of an effort to win 2-1 against Monaco at home. Juventus will be playing their ninth final against Real Madrid's record 15th. But Real Madrid have only lost three finals, while Juventus has been defeated 6 of their eight finals, their last victory coming in 1996 against Ajax Amsterdam (after they had earlier eliminated Real Madrid in the quarterfinals). Real Madrid are the defending champions and could become the first team to re-take the title in the 21st Century (and since the inception of the Champions League format). No matter what happens, this Champions League season has been one of the best ever, and both of these teams deserve to be in a final that is set to be match of the year in 2018! History will be made! Countdown for June 3rd has started! It all points to it being a fantastic Champions League final. After Real Madrid made fun of Atletico Madrid with a great display, Juventus showed at least as much quality when defeating AS Monaco 0-2 in Monaco. Monaco are a young side that has won many friends in the tournament and for its young players there are surely great years ahead. But Juventus' combination of quality and experience were simply too much for Monaco, who may have attacked optimistically and with skills, but were punished by any mistake to such as degree that Gonzalo Higuain ended up scoring both Juventus goals! (always poor in finals, one can almost not expect him to do anything there if they reach that far). If any team can defeat Real Madrid it is Juventus. If any team can defeat Juventus, it is Real Madrid. Of course, there is still a second leg for both semi-finals, but if the final is not Real Madrid-Juventus it will be an enormous surprise! It is not with delight that I say that a team that I dislike is the best, but after seeing Real Madrid take out Atletico Madrid 3-0, on three goals by a Cristiano Ronaldo on fire, I can barely see that any team can threaten them from retaking the Champions League title. Of course a lot of things can happen in football, and both Monaco and Juventus are quality sides, but last nights' display must be among the best I have seen from Real Madrid. And it was not just against any side: it was against Atletico Madrid, a side that has had a good take on Real Madrid, and is notoriously organized and difficult to play against. But Real Madrid made it look easy. One thing I could not help but think about is Zinedine Zidane: all attention goes to so many other managers in Europe, but no attention seems to be going to Zidane's managing qualities, which are proving to be truly outstanding as he is managing one of the most difficult clubs in the world! If they end up taking the title again, Zinedine Zidane should be the stars above them all in Real Madrid! Last week, when Barcelona defeated Real Madrid 2-3 in Madrid, Marcelo was unfairly criticized for not having made a free kick on Sergi Roberto when the defender rushed through the center in the last seconds of the match. The ball ended with Messi who scored the winning goal. A player should not be criticized for not making a foul, although in football terms I think any professional or fan understands that this is part of the game too. The defeat left the Spanish league title more open, with Barcelona nearly catching up to Real Madrid, who last night was facing Valencia, a team that has not been doing well this season, but who are notably known for being specialists in giving Real Madrid a hard time. And it seemed to be another flop when Dani Parejo equalized to 1-1 ten minutes before time. Previously Ronaldo had brought Real Madrid ahead, but he had also missed penalty against Diego Alves (who has saved the last 3 of 4 penalties from Ronaldo). 1-1 would have left the hunt for the league title completely open, but in came Marcelo, who scored the winning goal for Real Madrid with a sure right foot-shot. Real Madrid celebrated as if they had won the league, and I also think that goal will give the title to Real Madrid. Then everyone will have forgotten that Marcelo did the right thing in not stopping Sergi Roberto, by fixing it with a great goal that gave Real Madrid the title! I was delighted, sitting in Fuzion, in Monrovia, watching a great Juventus side tie 0-0 in Barcelona to make it to the CL semifinals. As the match wore on one supported Juve more against a Barca side that just seems that they are entitled to win and when things are against them they cannot handle it, least of all Neymar. There is a difference between a great fighter and a bad loser, and Neymar is not the former. But with this we have four teams in the semifinals, two Spanish, one French and one Italian: Ream Madrid, Atletico Madrid, Monaco and Juventus. South American World Cup qualifiers continue to be the most nerve-wrecking and closely fought contest in the world: every team can defeat anyone, and as the end nears seven out of ten teams can qualify, with one more outsider. Only Brazil, who started weakly but has risen over the last year, seem to be certain of going to Russia after their recent away victory in Montevideo against Uruguay, who remain in second spot. But Argentina tonight lost away 2-0 to Bolivia, and will struggle to keep their closest competitors from Chile, Colombia and Ecuador away. Even Paraguay could beat them to the World Cup spot, and Argentina could risk a play-off match, or worse, not qualify! Except for fans of Argentina (including myself) the worst consequence of Argentina not qualifying would likely be a World Cup without Lionel Messi. Let us face it; besides Messi, and perhaps DiMaria (and not counting an ageing and 'wasted-in-Barcelona' Mascherano), Argentina only has mediocre players who are not up to the task without Messi. Tonight's defeat to Bolivia was a case in point: after having defeated the South American champions of Chile last week (with Messi scoring the winning goal) Messi stupidly insulted the referee and got himself a four-match suspension. Argentina without Messi was a mediocre side unable to break the home side in the altitude of La Paz. With only four matches left, Messi will be available for only one. And they are not easy matches: Uruguay away, and Venezuela and Peru at home. Argentina's best hope seems to be that the other teams take points from one another and that they do not lose too many points in these coming three matches. It is not looking good for a World Cup with Argentina and Messi! Atletico Madrid and Leicester were arguably the two teams everyone wanted to avoid in the quarterfinals of the Champions League. Atletico Madrid are a passionate, skilled and disciplined side that has proven to have one of the best defenses in the world combined with an unforgiving attacking force. Leicester on the other hand, seem to be a team that is set to continue surprising; the best team in the world when underestimated. But all teams avoided them as both of these sides will be facing one another in the quarterfinals. An interesting anecdote is that two of the previous three times Leicester was in Europe, they were eliminated by Atletico Madrid (1961 and 1997). So this may be the time of redemption for Leicester. All will be incredible matches. Juventus-Barcelona a repeat of the 2015 final. Dortmund-Monaco two teams playing attacking football. Bayern Munich-Real Madrid will see two of the best teams ever having played the tournament. Last night Leicester eliminated the highly rated Europa League champions of Sevilla from the Champions League, making it to the quarterfinals. Despite a lucky 1-2 defeat in Spain, Leceister was all but lucky in their 2-0 victory playing an intelligent and disciplined match where they looked more like the team that took everyone with storm last season. Leicester are not among the 8 best in Europe, and will be facing some giant in the next round. But do not discount them: Leicester has surprised before! Last Wednesday I found myself in a bar in the city of Danane, in Cote d'Ivoire, at first only half-watching the Barcelona-Paris St. Germain match, but getting caught by Barcelona's incredible last 3 minute comeback to eliminate the Parisians. Along with most people in the bar, I was not happy. In Cote d'Ivoire they also supported Paris St. Germain. And whom I felt most sorry for were the Paris St. Germain fans; I know how it feels when your team loses, but I do not know how it feels when you come from the heights of happiness to the depths of sadness. I felt much more sad for them than for the Barcelona fans who just ten minutes before would have trashed their team out of the stadium. In the end Barcelona did something incredible, but not elegant. Their attitude will and should annoy any decent football fans, and the admiration for Luis Suarez' skills are just frustrated by the ugliness of his antics. But I cannot blame them: this is part of football, as much as I dislike it, and had it been my team, I would have been celebrating it like Barcelona fans did. All great teams know how to stretch the rules, and Barcelona were just better at it than Paris St. Germain, which just makes it more sad for the great Parisians!!! Barcelona is in the next round, but at least in Danane, as in Paris, it was not celebrated! No matter what happens in the rest of this seasons' Champions League we will remember last night's match between Manchester City and Monaco. 5-3 and a festival of goals and drama, the only bad thing that can be said is that at times defenses looked very shaky. But that has to be seen against the background of strikers who all seemed to have a good day: Radamel Falcao looked as a young man from his pre-Manchester United days (despite him missing a penalty against Willy Caballero, who may be better than hapless Claudio Bravo, but still had a difficult match alongside his defense) and Sergio Aguero had one of those rare days when he was world class in an important match. But most impressive was the young Leroy Sane, who is really proving to be the best transfer this season. Monaco impressed because of their attacking prowess and positive attitude, and Radamel Falcao's penalty miss when they were up 0-2 may have cost them the match, despite them eventually going up 1-3 before Manchester City's memorable comeback. Manchester City showed an amazing character which should give them confidence for better results. The return match in Monaco will be a must-see for every football fans: Monaco must attack, which they have shown they can, against a City side that has shown they cannot defend, so must attack. Do not miss it! Everyone, except FC Barcelona, seems to know that Paris Saint Germain has a quality team who under Unai Emery has learned to prepare for a match. And Barcelona seemed stunned the entire match as they proved inferior to PSG in every regard. It would have been nice to have a "Manita" to rub in Barcelona's faces, but in the end it was "only" 4-0, a result FC Barcelona can be most thankful about. First about PSG: They seem to be the team of the future. Young players like Adrien Rabiot and Julian Draxler excelled, while "older" faces such as Marco Verrati, Angel Di Maria and Edison Cavani totally outshined Messi, Neymar and Suarez. Di Maria and Cavani both scored goals full of love on what was also their birthday. The main reason for the result was a splendid PSG side who could go all the way if they play like today! But one must also mentioned FCB: the fact that they played such a horrible match can only be blamed on the manager, Luis Enrique. Do not mind the demotivated side, but some choices were simply awkward; Andre Gomes instead of Rakitic made them lose the midfield and Sergi Roberto was so bad as right-back (admittedly not his natural position) that it was like handing Draxler a highway to run on. Barcelona are all but out of the Champions League and with meager chances of winning the Liga title, they may take a consolation with the Copa del Rey, but the question is whether this is enough for Luis Enrique to maintain his job. I was unable to watch the Final of the Africa Cup of Nations because I was stuck in Morocco when their lousy national airline could not get me off the ground to go to beautiful Liberia. And how is it that there was nowhere to watch the final? But much more important is that Cameroun won! The fact that I did not see it does not diminish the accomplishment of a team that not much was expected from at the start of the tournament, but who, most of all, showed discipline and camaraderie. They were perhaps the team that most wanted it, and to come from behind against such a defensively disciplined team as Egypt was a great achievement. It is great to have the Indomitable Lions back among the best in the world! The two semifinals of the Africa Cup of Nations are over, and many did not expect the outcome, and are rightfully disappointed (myself included). Burkina Faso played a great match against Egypt, and in particular in the first half were in total control. But the Egypt of Hector Cuper are extremely well-organized in defense and are deadly in counter-attack. Although Burkina Faso scored the first goal against the Egyptians in the tournament, the end result of 1-1 tokk the match to a penalty shootout where the veteran goalkeeper Essam El Hadary saved the day for Egypt. The Burkinabe are understandably disappointed, but expect to see more to them in the future. Then there is Ghana: a dominant African power who have been in the last 6 semifinals, but have not managed to win the tournament since 1982. And again they were favourites to beat a Cameroon side that has been full of problems in this tournament. But the problem with Ghana is that they see themselves as rightul champions: and you are no kind of champions until you have won the final. Cameroon won 2-0 on a match were they fought hard and just seemed to want it much more than Ghana. And that is the real credit of the match: an excellent Cameroon side that will surely give everything to defeat Egypt! I had been hoping for a Ghana-Burkina Faso final. But while we can see these teams play for bronze, the final will nevertheless be very interesting! The year has for me started a bit oddly, with a lot of travels and work that has not fully permitted me to dwell into football. This is a pity since one of the best tournaments that modern national team football has to offer has started in Gabon, namely the Africa Cup of Nations. And although I have only watched a few matches from my base in Monrovia, it is full of excitement! Firstly, the hosts from Gabon were eliminated in a group won by Burkina Faso ahead of Cameroon. The most talked about was the elimination of the Gabonese, but credit to a tournament-oriented Burkinabe side and a Cameroon side of indomitable lions who have not gone beyond first round since 2010. Gabon's elimination was not as sensational as that of the highly rated Algerians, who with a team full of stars were expected to make it far. But a defeat to Tunisia and ties to Senegal and Algeria saw them out with meager 2 points, while an exciting Senegal side won the group ahead of Tunisia. Another big team eliminated were the defending champions of Ivory Coast. Much was also expected, but like the Algerians they also only managed 2 points with ties against DR Congo and Togo, while losing 0-1 to Morocco in the last all-important match. Morocco are not exciting to watch, but solid, and Ivory Coast's stars seemed to underestimate them. The big surprise was probably the DR Congo, who ended up winning the group ahead of Morocco, and will be one of the sides to watch. In the last group Egypt and Ghana did what they were expected to do, easily outplaying Mali and Uganda and playing for first place tonight, in a match Egypt won 1-0, playing very intelligently against a Ghana side that could surely go all the way with its experience and talent. The matches promise to be great in a tournament full of surprises. Most of these teams follow their dreams of victory instead of dear of losing!! Although I will not be in Africa to follow all the quarterfinals, be sure I will! Today FIFA decided to expand the 2026 World Cup from 32 to 48 teams. This is another decision that will undermine the footballing interest in a World Cup that all fans love, but which has steadily fallen in football quality during this century, and will surely deteriorate more with this. In the short term the expansion may increase interest in countries that never have had a chance of qualifying. But when these countries lose again and again to other mediocre teams in mediocre matches, it will bring less and less interest among the real football fans, if not among the (many) people for whom World Cup football is nothing more than a Nationalist Masturbation Contest. We will see more flags and hysteric nationalism, but less quality football. At least under Sepp Blatter, for all the many things you could criticize him for, football came first. Under the new FIFA leadership it is the short term prospect of making millions to the detriment of the game. UEFA supports it; I am not surprised as they decided to expand the European Championship exactly for the same reason. But at least UEFA presides over the tournament with the best football quality in the world, namely the Champions League; UEFA knows national team football is a dying breed, so why not exploit it...? I started loving football because of the World Cup. It was where football dreams were made. I have been seeing the World Cup deteriorate as I grow older, and for any young football fans football dreams are now made at Club level, mainly in the Champions League. I am sad to see the World Cup fade into the irrelevance of mediocre football, and I view this as one of the biggest nails in the coffin of the World Cup. I had really hoped that the arrival of Cesare Prandelli as Valencia manager would change things for the (now tiny) Spanish giants. But I was wrong, after only three months in charge, and only one league victory, Cesare Prandelli has resigned in a way that has to make Valencia fans wonder if the problem with the club is the managers (there have been nine managers since 2012) or something more systemic. Mr. Prandelli's qualities as a manager cannot be doubted, and he is just one among many successful managers who have left Valencia without success. So what is wrong with Valencia? Is it a management who thinks more of numbers than about football? Is it players who have no commitment for the club? Is it fans who are not supportive enough of young talented players? Or is it rather a combination? Truth is that Valencia, who ten years ago was among the great clubs in Europe, is now nothing more than a mediocre club that fights to avoid relegation. And as a fan of Valencia, it hurts to realize this. In 1986, 30 years ago, I spent a couple of months in Mexico. 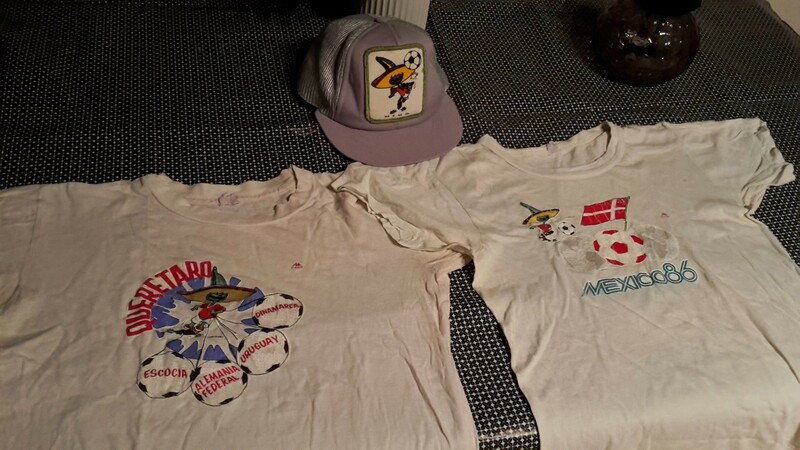 It was just up to the 1986 World Cup, and I had come from Argentina, and was going to Denmark, and this became, in my subjective view, the best World Cup ever! A memorable group won by Denmark (it was their first World Cup) and followed by the later finalists of West Germany. Who would have thought this group was going over to history? 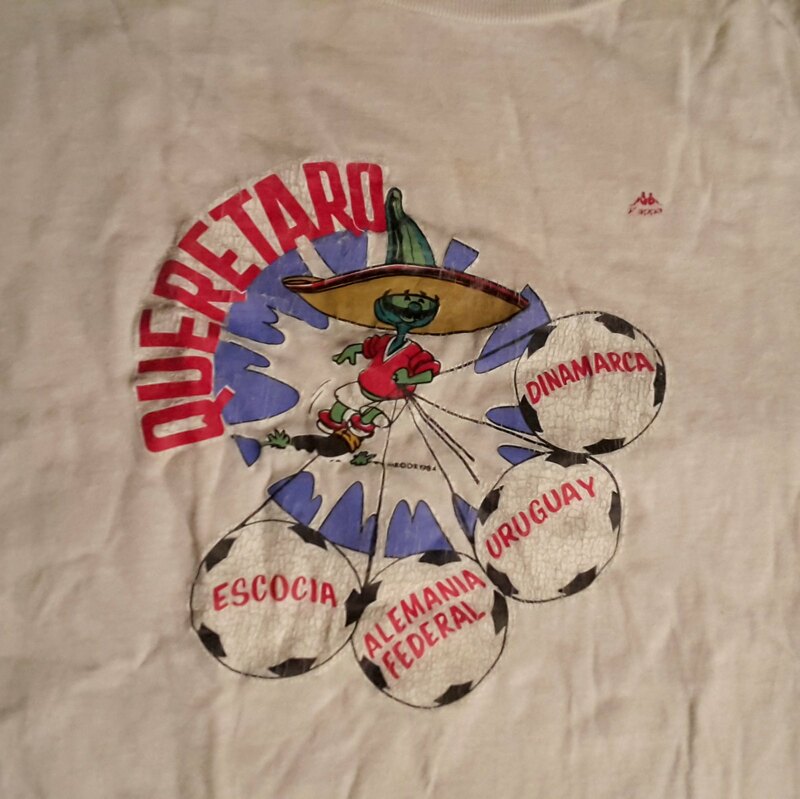 The t-shirts are old and too small for me today, but certainly remain an old memorabilia worth keeping for a football World Cup history fan!